Pyramid Valley is one of New Zealand’s best kept secrets, though as their reputation grows around the globe, more of us here at home are discovering the fruits of their unique wine-making process. Biodynamics, hand-based viticulture, low yields, natural winemaking – these are some of the means they have adopted to produce their exceptional vintages. 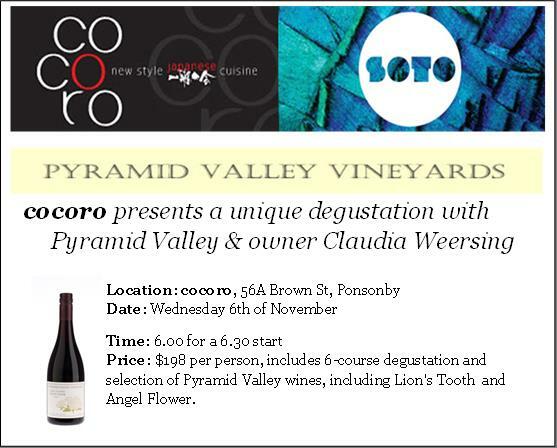 We are very excited to team cocoro with a six course dinner with wine matching of at least seven different wines, including two of their home block flagship wines, the Lions Tooth and Angel Flower! Vineyard owner Claudia Weersing, who founded Pyramid Valley with husband Mike in 2000, will be at the dinner on the night to present the wines. Claudia is a committed biodynamicist, happiest when tending to their 2.2 hectares of home vines. Chef, Makoto Tokuyama will provide a menu guaranteed to amaze and delight your senses.